You set your marketing budget a few months ago. You’ve made some good progress so far, but how does it stack up against your plan? Now is a good time to review your B2B marketing budget, make any requisite changes, and gear up for what you haven’t gotten to yet. What we’ve found is that spending a marketing budget requires expertise and discipline (especially in B2B where you’re constantly pulled in different directions by internal stakeholders, partners, clients, and more). Without the expertise to prioritize marketing efforts, you’ll be faced with myriad options at every turn. Without discipline, you could spend thousands within mere moments. This blog is a follow up to our eBook, CEO Guide to B2B Marketing Budgeting & Planning: Preparing for New Investments, which lays out how big your marketing budget should be, what types of marketing investments to make, how to allocate your budget across all the different marketing activities, and how to measure the impact of your investment. The purpose of this blog post is to guide you to develop a flexible marketing budget and to make smart decisions when your budget is already in play. Below is a look at the top marketing areas that warrant your company’s focus and some key factors that you should consider. Which marketing areas should your company focus on for budgeting? 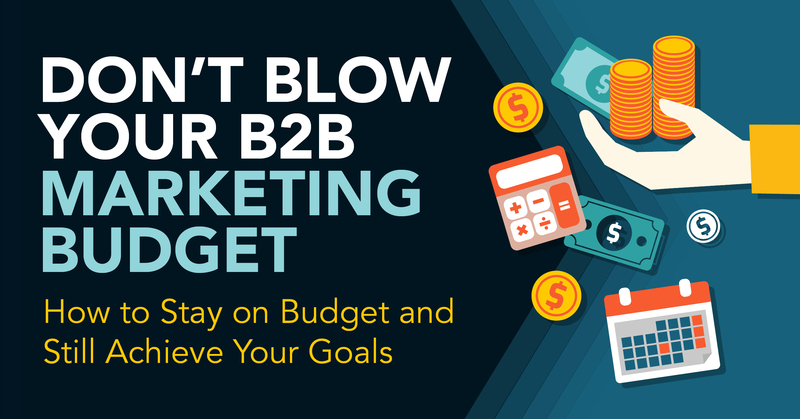 If you’re like most companies, you define your B2B marketing budget at the end of the year (fiscal or calendar) when there are a number of competing priorities that require your attention. To do it right, you’ll need to sketch out your entire marketing plan for the year, which requires a level of detail that is frankly exhausting. The truth of the matter is that things change quickly as you make progress on your marketing plan. You may be seeing a lot of traction in one area and not in another, so you shift gears. Is your budget designed to accommodate that? One way to simplify the budgeting process and allow for more flexibility is to use a categorical approach to your spending. By focusing on the three key investment categories below, you can outline a spending plan that enables you to focus on your overall strategy and piece together the minor details later. This category includes the salaries of any internal employees, money spent with external contractors or agencies, and any expenses required to train these individuals in certain areas. Defining a flexible “people” budget requires that you review your marketing plan and understand your internal capability to execute. Do you have the expertise to do what you’re intending to? If not, can your team be trained on it? When there’s a gap, outside help can fill capacity or skill set holes. It can also be a great option if you’re partway through the year and don’t see how you can accomplish your plan’s top priorities. Many companies decide that they need a variety of skill sets, ranging from content expertise to SEO. If you’re considering a company that specializes in one area of marketing, like PR or digital marketing, know that their recommendations will focus on that one facet of marketing and may miss the broader strategy. Full-service marketing agencies can be a great option for those looking for the perspective of outside experts and when diverse skill sets are required. Even if you only need support in one area, they tend to approach programs more holistically than a specialized firm would. If you need insight into whether hiring an in-house staff, outsourcing your marketing, or building a hybrid solution is best for your company’s goals, read our e-book: Staffing for Growth: Outsourcing vs. Hiring vs. Hybrid Marketing Team Structures. This bucket includes any kind of marketing or sales technology or software that it takes to fulfill your marketing strategy. Tools that provide the data that fuels program execution, such as sales intelligence platforms (DiscoverOrg, Zoominfo, and LinkedIn Sales Navigator). It’s important to note that everything will flow out of your CRM and marketing automation system. If you don’t have one or the one you have is not working for your business, it could be time to invest. How well does your existing system work? Is your team using it (e.g. sales, marketing, delivery) and is it supporting their efforts versus slowing them down? Is it easy to use or are you wasting valuable time doing workarounds (e.g. data entry, segmenting by audience type, etc.)? Does it integrate in the ways that you need to your other tools? Do the costs and benefits align? In your mind, is it worth the cost? If you’re concerned about making a big upfront investment in any of these areas, many have free trials or pilot options. In any case, consult an expert to determine how the technology will translate to your business objectives. Keep in mind that that implementation and adoption will take time—in all likelihood, you will not start seeing the ROI right away. There are hundreds of technology options you could choose to augment your sales and marketing efforts and they change on a regular basis. Conducting regular research to ensure you’re utilizing the right software and technology for your business, as well as taking advantage of all opportunities to be as efficient as possible, is important to many growing companies. One of the best ways to stay up to date is to attend sales and marketing tradeshows and spend a chunk of time meeting with exhibitors. For companies in the B2B tech sector, we think primarily in terms of digital advertising (e.g. Google AdWords and LinkedIn advertising) and select event or association sponsorships (sponsoring a booth at a tradeshow or content syndication with a media outlet). Advertising is often the smallest percentage of a company’s B2B marketing budget as it gets the leftover dollars from whatever is not consumed by people and software and technology expenses. But that shouldn’t always be the case. If you want to drive leads into the funnel quickly, increase your monthly advertising dollars. One of our clients, a tech services company, created a high value report and turned to LinkedIn advertising to start driving leads to it. Within two months, they had generated 27 leads with senior level titles at target accounts. Another client, a healthcare data services client, generated 13+ new clients and built over $2M in pipeline from Google AdWords. While some may consider only giving advertising the “leftover” budget, it can make a big impact when done right, especially because digital advertising can get very specific in targeting (down to specific titles at specific companies). If you’re more focused on brand visibility or on connecting with lost accounts, customers, leads already in your funnel or leads easily obtained from partners, your advertising budget likely does not need more investment (right now, at least). What factors you should consider before you commit to any expenses? If you are planning to enter any new sectors or markets, you may wish to adjust your spending to free up dollars to target those audiences. If you want to expand your relationships with channel partners, for example, you will want to reserve some portion of your marketing budget for face time or to support channel marketing programs. Likewise, if you plan to add any products or services to your existing portfolio, you will need to allocate a portion of your budget to properly launch your new offerings. Whatever your growth plans, consider them as you build your marketing budget. Keep an eye on your competitors’ latest cutting-edge marketing programs. For example, one of our consulting clients’ competitors introduced an “audit” service that had the market buzzing. Concerned about losing market share, our client tested a revised version of the same concept with a few customers and has already begun to advertise it. Inspiration can come from the most unlikely sources and you’ll want to ensure your marketing budget can support any new programs or offerings you want to bring to the market. Paying attention to what is happening in your industry is important to spending your marketing dollars wisely. You will want to attend industry events or pay for a feature in an industry-specific publication. Make room in your marketing budget to stay on top of industry trends. Is your website helping or hurting you? Make sure that your website is actually doing your company justice. If it’s not fancy just yet, that’s fine, but if messaging is off, the look and feel is dated, and doesn’t support your sales efforts, it may need a refresh. SEO and lead generation forms may be able to wait (depending on your growth stage), but the other areas cannot. Do you have systems in place to test the success of your programs early and often? While ROI can range from different types of investments, it’s important to understand the value of your efforts before you invest. As outlined above, there are many factors that shape the way you can allocate your B2B marketing budget, especially as priorities change throughout the year. We encourage you to think holistically about your marketing budget and how you can squeeze all that you can out of your investments. For example, if you’re writing a blog post, what can you do to leverage your hard work beyond just the blog itself? You may consider publishing it on LinkedIn Pulse, sending it to your email list, publishing it on your personal and company social media page, and sending it to re-engage prospects. One effort can go a very long way in marketing. We hope this blog post helps you feel more comfortable with your marketing budget and relieve some of the stress marketers often feel as they implement one. Falling behind on your plan or ready to jump in but not sure which direction? Start with our Rapid Marketing Assessment & Plan to analyze your company goals, help you establish your marketing priorities, and maximize return on your marketing dollars.